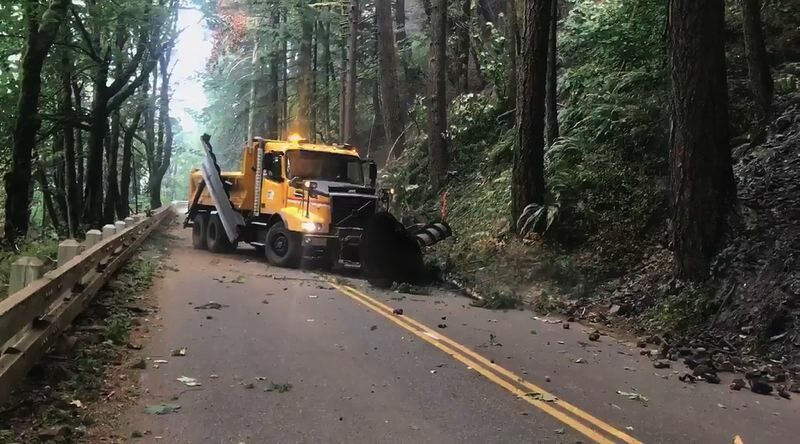 Officials said an estimated 2,000 damaged trees could fall onto I-84, and rocks from slopes above the highway also could possibly fall onto the road. Oregon's Department of Transportation said Wednesday, Sept. 6, that it had no firm timetable to reopen a 45-mile stretch of Interstate 84 and the Historic Columbia River Highway closed by the Eagle Creek Fire. The Eagle Creek Fire that started Saturday, Sept. 2, and roared west, consuming more than 30,000 acres, forced ODOT to close I-84 between Troutdale and Exit 62 near Hood River on Monday. ODOT officials said it was first making certain the highways were safe to travel before deciding when to reopen the roads. An estimated 2,000 burned and damaged trees could fall onto I-84, officials said, and rocks from slopes above the highway also could possibly fall onto the road. ODOT inspectors were also evaluating I-84 bridges and tunnels to make sure there was no structural damage because of the fire. So far, ODOT officials said, no damage has been found.